However, many of the latest developments have yet to be committed to authoritative reference works. Even for older methods, the key contributions are often scattered in disparate outlets, or remain in a form that is inaccessible to beginners. Our ambition is to develop a book series which reflects the current dynamism and creativity in the field and documents and explains cutting-edge economic methods for postgraduates, academic researchers, and professional economists. 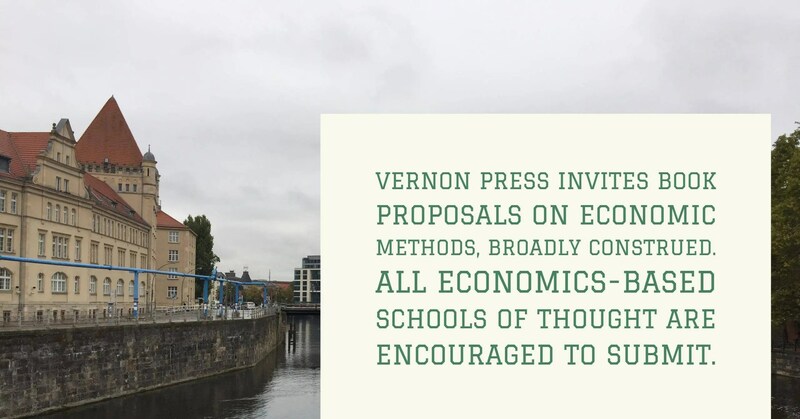 We invite proposals across the range of analytical methods, principally quantitative, but also qualitative, discursive and historical drawing from fieldwork, interviews, content analysis or any attempt to document and explain the contemporary “tools of the trade” in economics. While we would expect authors to be applied economists with hands-on experience in the application of the described tools, the intended audience may expand well beyond trained economists. Dynamic stochastic general equilibrium models, Computable General Equilibrium models, Stock-Flow Consistent models. Econometrics (introductory or advanced) including new estimators, bayesian techniques, non parametric analysis, hierarchical modelling, instruments, structural models. This entry was posted in Call For Papers, News, News - Other and tagged big data, dynamic stochastic, Econometrics, economic methods, equilibrium, forecasting, GIS, stock-flow, Vernon Press. Bookmark the permalink.